Earlier this week I showed you how we had made some Doll’s House bunting using Scotch Magic Tape. 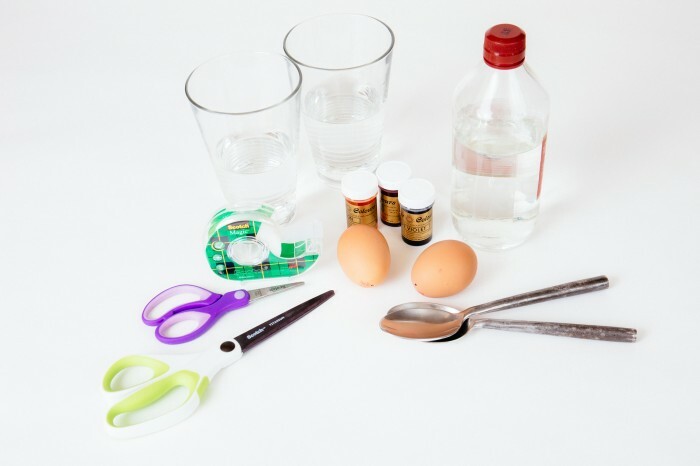 Well today Scotch Magic Tape are back with a guest post on how to decorate eggs. You can either use hard-boiled eggs which is always the option I would go for or if you are feeling extra brave you can blow eggs then use the shell. Hard-boiled eggs are better when working with children but blown eggs last longer. To blow eggs you need to pierce the narrow side of the shell with a pin, making sure it goes through the membrane, then repeat on the wider side of the egg, again making sure it goes through the membrane. Then you turn the egg back over and blow through the hole on the top which pushes the raw egg out of the bottom hole. 2. Mix half a cup of water with 2 tablespoons of vinegar, the vinegar ensures the dye stains the egg shell. 3. Add your chosen colour of dye, the more you add the deeper the colour will be. 4. Place the eggs in the coloured water. Use a spoon to hold it down if you are using a blown egg as it may float. Leave for at least an hour, the longer you leave it the deeper the colour will be. 5. Remove the egg with a spoon and gently pat dry with kitchen roll. 6. Peel off your Scotch Magic Tape to reveal the un-dyed shaped underneath. If it looks a bit tricky then you can watch a step by step video here. For more ideas and inspiration on how to use Scotch Magic Tape for a range of everyday uses visit www.facebook.com/ScotchUK. Post in association with Scotch Magic Tape.